I'm facing a problem with timer. I tried to make a countdown (from 60s to zero) and everything works fine when I first call the method, but when I call it second time, it goes twice as fast and so on... How to fix it? I don't see the exact cause of your issue. 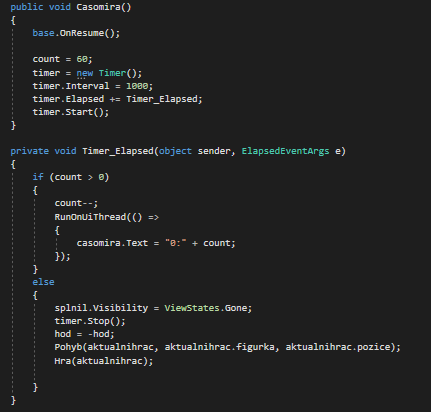 But here's a snippet of timer code I have running in one of my Xamarin Forms applications. I think both these approaches fall into the trap of assuming that a timer will trigger its update event at exactly the interval if the timer. My experience is that the timer update event may trigger at or after the interval. Therefore you can't set a 1 second interval and just decrement a counter at each update event. Create a timer with an interval at which to check and update the UI. @JamesLavery is correct. For an accurate timer you will want to check it against a stored start time for accuracy.